Children from Year 2 to Year 6 regularly take part in Big Write sessions (extended writing). We play games and do fun activities to help us improve our writing and then put these skills into practice. We have fun with 'wow' words and mysterious characters to help us with our VCOP. Children in EYFS and Year 1 regularly take part in Talk for Writing sessions. WHAT IS VCOP AND HOW CAN IT HELP US TO WRITE BETTER…….. This stands for Vocabulary. We always try to impress by using 'wow' words in our writing. We can 'steal' 'wow' words from books, the television or even each other. The thesaurus is also a useful tool. C is for Connectives. We use connectives to extend our sentences- they are like 'joining' words. The better the connective, the better the sentence. O stands for Openers. Great writers think carefully about how to open a sentence in an interesting way. We can use who, when, where and how openers. WHO- The children were doing ‘Big Write’. WHEN- On Thursday, the children were doing ‘Big Write’. WHERE- In the classroom, the children were doing ‘Big Write’. HOW- Quietly, the children were doing ‘Big Write’. P stands for Punctuation. Every sentence that we write needs to be punctuated. 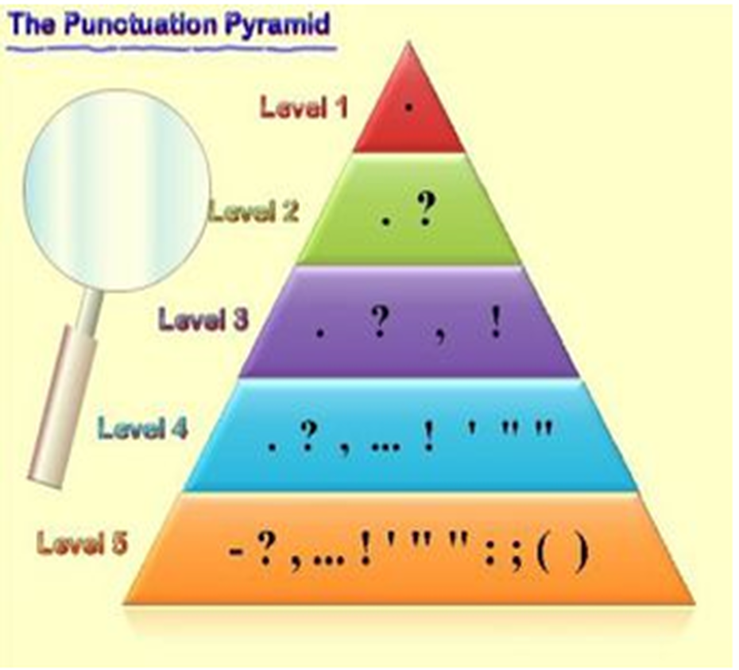 We use the punctuation pyramid to help us remember the punctuation that we can include to impress.